brandflakesforbreakfast: was Jackie O. a fan of selfies? was Jackie O. a fan of selfies? 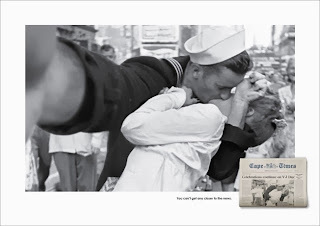 As part of a new ad campaign, South African newspaper Cape Times has transformed some of the most famous photos in history into selfies. Utilizing the tagline “You can’t get any closer to the news,” the ad campaign gives us a different perspective on photos of historical figures such as Jacqueline Kennedy, Winston Churchill, and the royal couple. The “Kissing the War Goodbye” selfie is actually so realistic, we could have sworn we saw a similar photo on Instagram just this weekend!